Look who is enjoying 80° weather in West Palm Beach, FL today!! Our Nats head home in 10 days for the season opener on Thursday, March 28! Who is planning on being at the game? 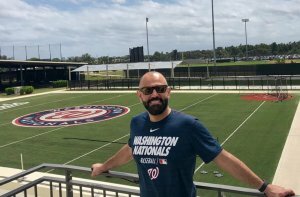 #nats #sportschiro #drh#baseball #washingtonnationals#unitedwellnesschiro — at Fitteam Ballpark of the Palm Beaches.